Tagged under Makoto Shinkai, CoMix Wave Inc., Series. 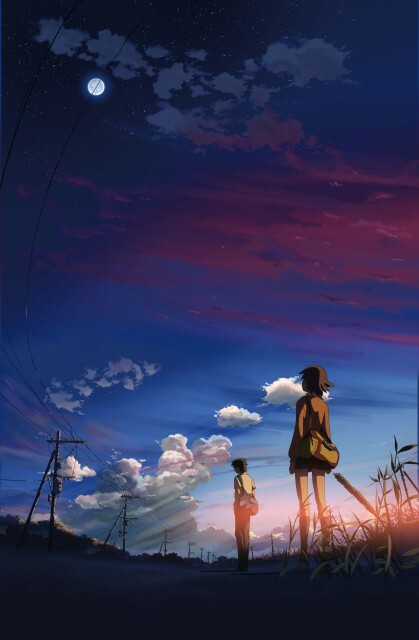 Overall, 5 Centimeters Per Second is a wonderful movie with unique storyline, beautiful animation and a good selection of music; they display what life really is and I love it. Although I also like "Voice" and "Place," I actually prefer this movie, perhaps because it's more realistic, the plot is easier to understand, and it has a stronger impact on life. Furthermore, I can see while people referring Shinkai as the new Miyazaki, it's utterly rare to see a movie with a strong influence like this since Grave of the Fireflies. 5 Centimeters may not be the best, but it is unquestionably (anime or not) one of the most achieved profound human stories I've known and it will surely be talked many generations later. The movie, presentation, art and concept of the movie was really really good. But i did not like the fact that all three of the characters instead of having courage to find, and confess to their loved ones just go and pursue a depressed and lonely life. Okay, now i get tge movie's ending. For all the work put into the background art and scenery, more needed to be done into developing the characters and their stories, it just felt too vague. Akari's story needed more development to give her character growth. This particular work by Makoto Shinkai just fell too short for me. Very bittersweet. I can't hep but think of how things may have changed for the better had Tohno actually sent those emails, texts, etc to Akari... Wish there would've been a happier ending for Akari & Tohno. Sigh!... Yes,that's right.Its that kind of story(anime or not) which leaves You heart broken & with a "sigh!.." impression.Even best friends & lovers can be parted by distance & time,this is the reality of this world.Though the slow pace of the story can test your patience,try watching it completely without touching the forward button.I don't remember watching anything so realistic & heart touching ever.Even after watching it so many times & um still willing to watch it again.Realistic story,great voice acting,nice music (a nice song included),heart touching ending,..what else do you need in 1 hour.Its a must watch & a classic which will be remembered after many generations.At last,a piece of Advice,"Don't dare watching this right after a break-up,you will probably think about committing suicide!" Not really original, but for its genre it was great. I’m not a drama fan, and the story didn’t make me cry, but the animation was out of standard good. Awesome images, full of meanings, beautiful and colorful. Also, even thought the story is slow, it doesn’t get boring. Important lesson of life on relationships and distance. Makoto Shinkai ... this is island in the sea of ​​anime. No matter what topic he affects - it is always impressive works. This is the first anime what I was willing to divide and admire each shot. I enjoy by visual side so much that was a bit inattentive about story. It's simple enough but interesting the same. I can understand every personage because I was myself at their shoes. And final was clear and sad - we can't stop the time of our life even for the real feeling like can't stop the flying of sakura petals. Directed by Makoto Shinkai. Five Centimeters Per Second is sad, tragic, sweet, poetic, touching, and melancholy still this movie is astounding. This movie is a great work of art no matter how sad it is. Every scene you can feel the effort put into it to make it shine. The story is about young love and how far it can span in years and in distance apart. The story is done form the lead male, Tono Takaki, and is about his friendship and feelings for his close childhood friend Shinohara Akari. The story spans over many years. The show makes a great attempt to form a melancholy atmosphere but with hope mixed in and it does it well. Every time something progresses in the story line you always want it to go Takaki’s way and have him and Akari reconnect. The end is very powerful when the movie suggjest that Takaki and Akari walk by each other but a train cuts off their view of each other and by the time it passes by Akari has walked off leaving Takaki to wonder. It tells of regreat, moving forward, and lost love in the most powerful way. The music composition is great. Every song adds to the story. Tenmon does a great job setting up the music to help the mood of the movie. I enjoyed this movie and love to re-watch it even if it just makes you want to cry. TAKAKI TONO: "Do you know? The speed at which cherry blossoms fall… 5 centimeters per second. At what speed must I live… to be able to see you again?" Beautiful artwork and a touching story. I really loved the style and art work, especially in the background and small details to this story. It was a very heart warming and great movie that I know I'll watch it again some night just to see it again. I just need to find the time to just sit and take in all the details it had as there were so many! Well, who can deny the beauty of this series?? sad, hit too close to home. I cried through the whole entire anime. I just could not own it, once of such a sorrowful feeling was just enough for me. everything was outstanding in this anime, but at the time, it was just too perfect of how I felt. always one step ahead or behind the person you were destined to be with. A breathtakingly beautiful art and storyline. So far, this is one of the few movies that got my tears flowing, as I realized how sad the story went yet they actually happen in real life. And just like the rather vague ending, there are some things in life that don't have definite answers, but instead you'll find yourself asking more questions. So if you're a sucker for emo-ish romance-themed movies, this is worth a try. At first, when I saw this movie, I thought it was sad and too realistic. Throughout the whole movie I did not cry, but once in ended I did. It was a great movie about love and how distance can change everything, and overall I thought it was a great movie. gosh watched this so long ago that i don't remember the details very clearly. rating based on other criteria: 1) shinkai bg art is pure love and 2) it managed to evoke a sort of subtle sadness in me, which in a way trumps full blown in your face tragedy. No feedback on Five Centimeters Per Second.